Epiphany is distinguished by the lot of its design. Indeed, his appearance is inspired by sports cars. Three designers are behind this concept, they are: Nathan Gendotti, Yaylali Caan and John Guarino. Rather it has a great length of 35 meters and a width of 9 meters. It is flanked by an aggressive look, luxurious and elegant. Battery life depends on its average speed. 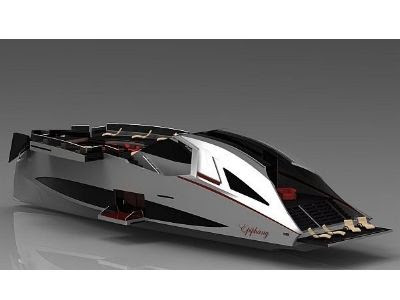 It can travel 5,550 km at a speed of 10 knots, 4630 km at 15 knots and 3330 km at 20 knots. Inside, it has a master suite spanning 9 x 5 meters. Epiphany also has a suite fle platform.